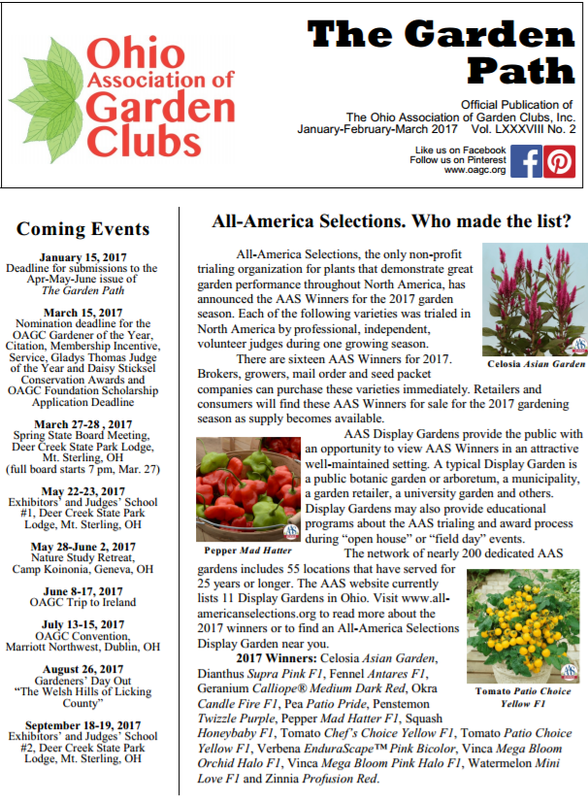 Findlay Garden Club is a member of the Ohio Association of Garden Clubs, Region 2. A spring garden school held in March 1930 at the Ohio State University Horticulture Department resulted in the organization of the Ohio Association of Garden Clubs. The charter clubs came from every area of the state and were eighty clubs strong. The Association has given instructions on growing, propagating, identifying, and sharing all species of plant life, as well as new gardening methods. and to encourage the youth in the same areas. Below is a lik to our quarterly newsletter, "The Garden Path". You can learn more about the OAGC at their website thru the link to OAGC, or go directly to the Garden Path newsletter by clicking the Garden Path image below.